There's also mockery of terms like "pain points," "mindshare," "ecosystem" (when not used to mean a real ecosystem), "brand agnostic," and "move the needle," among others. I can vouch for the fact that some of this business-speak is infiltrating the legal world, unfortunately. 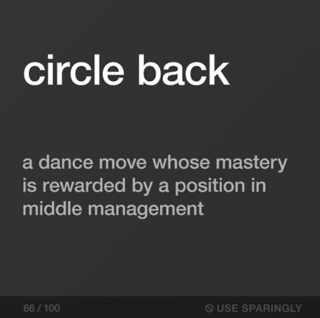 "Circle back," apparently meaning "to meet/communicate again later," is definitely in use. And what's the difference, if any, between "circle back" and "touch base" (also on the list)? "Circle back" sounds a little like I'm supposed to try to make sure I'm not followed. "Out of pocket," "drill down," "circle the wagons," and "get our ducks in a row" are also creeping in. Maybe most horrible of all is the term "deliverable," which apparently means "what the client will get after we finish the project." Well, hopefully you know when you're doing the project what the end result is supposed to be. Is it a problem to use the actual word for it? Also, I don't think clients want projects to end with something that's "deliverable." I think they want you to actually deliver it. Not to suggest the jargon only flows one way. For example, "utilize" is on the list (correctly defined as "a three-syllable version of 'use'"), and I'd call that classic legalese. My sense, though, is that it's probably easier for business-speak to get into the law than for legalese to go the other way. Legal language tends to be more archaic, probably because lawyers think in terms of precedent so they tend to preserve old Latin terms and outdated forms like "hereinafter." Business-speak, on the other hand, can be more forward-looking, which is why you get terms like "mindshare." Lawyers also have an interest in giving the impression they have come up with something new and super-great, so we might pick up stuff like that. But legalese wouldn't seem to help businesspeople much. Don't get me wrong, one is not better than the other. That'd be like arguing about which invasive species is worse, kudzu or the sea lamprey. Both are disgusting, they just thrive in different environments. Okay, this sort of language is irritating, but does it really matter? Hell yes it matters. It matters because for the most part it doesn't mean anything, and so it doesn't communicate anything. Worse, it often prevents communication. [A]s the Valukas report shows, these idioms and corporate cliches are more than just buzzwords that threaten our linguistic sanity. At GM they stood to mask real meaning, obscured leaders' responsibilities, and created labels that hindered the critical thinking needed to keep real problems from getting worse. Instead of putting someone "in charge" of finding the "cause" of the problem, apparently, they asked the executive to "champion" the investigation into the "non-deployment." Turns out the "champion" didn't actually understand what "champion" meant, or what the person who asked him—a lawyer, by the way—meant by it. So he claimed, at least, that he would have acted differently if he understood the urgency of the issue and that his team was expected to find the actual cause. I don't, by the way, agree with the reports (like this one) that blame PowerPoint for communication problems like this. Slides don't make themselves. If you put jargon on one, or cram it full of text (which is not what it's for), that's your fault, in my view. The foregoing conclusions were not influenced by the fact that my firm doesn't represent GM but does represent Microsoft. I'm brand agnostic on this. If that's what that means. Have You Ever Paid Royalties for Singing “Happy Birthday”?